Horse-drawn carriages don't belong in New York City, and it's not surprising when accidents happen. So when a 6-year-old Belgian draft horse named Pumpkin spooked and ran wildly into Central Park, pulling an empty carriage before smashing into an open taxicab door, we tallied the accident and breathed a sigh of relief that there were no fatalities or serious injuries. Not yet, anyway. The carriage trade wasted no time in brushing off the accident, dismissing it as a fluke and characterizing it as an example of "professionalism" and horsemanship. Nothing could be further from the truth -- this accident was a disaster waiting to happen and the competency of the driver should be questioned. Except within activist circles, that questioning is unlikely to happen. New York City carriage drivers receive very little formal training, and it shows. 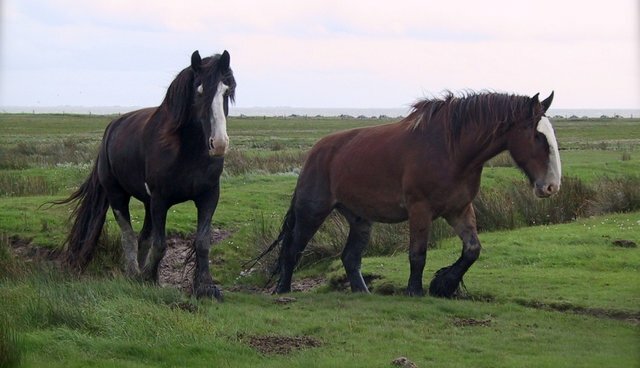 This accident was particularly upsetting to true "horse people" because a Belgian is large horse breed that typically weighs at least 2,000 pounds. It is very dangerous to be in the path of 2,000-pound carriage horse who is running for his life -- there's very little margin for error. The city must take note of this. Carriage driver incompetency is not an insignificant matter. It's another reason for an outright ban. Bridles Don't Just Fall Off a Horse It was widely reported that Pumpkin "slipped his bridle." Just slipped out of it. That should never have happened. A horse who was properly tied by a halter and lead rope to a sturdy stationary object, or whose driver had been in the box (driver's seat area) of the carriage and holding the lines, would never have spooked this way. Halters are more difficult to rub off than the type of bridle often seen on NYC carriage horses. Among carriage operators who put a premium on safety, a popular addition is the inexpensive safety strap known as a gullet strap, which could have prevented Pumpkin's bridle from being pulled off accidentally. Safety of passengers and passersby should trump greed and profit motive as a top priority in the New York City carriage trade. Finally, the horse should not have been allowed to get so close to the carriage in front of him, allowing him to rub his face and head on that carriage in front. Without a gullet strap, a bridle can slip off. Do bridles fall off? They can. Should it happen in New York City, in which the carriage boasts of unmatched professionalism? Never. 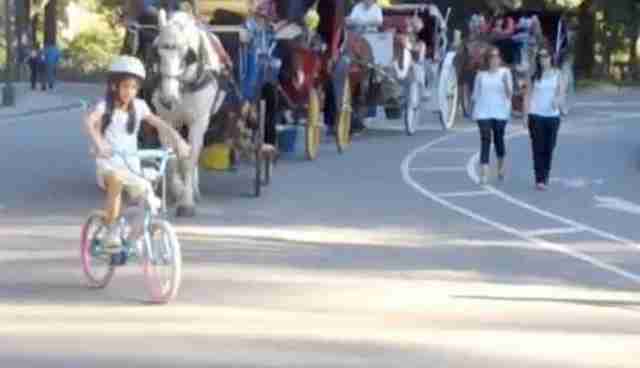 The 27-year-old carriage driver's assertion that the bridle slipped was reminiscent of a 2010 Independence Day parade accident in Iowa that left 20 people injured and one woman dead after two terrified carriage horses charged into a crowd of people. New York City carriage operations are inherently inhumane and dangerous, and horse-spooking accidents are one of the very top reasons for it. Traffic is an ever-present spooking risk, but a horse can spook at the slightest provocation: a leaf rustling in the wind, a car door or umbrella opening, a plastic bag or a startling noise. It was said to be the sound of drummers that caused Smoothie in September 2007 to become terrified and spook. She died on Central Park South. Like Pumpkin, Smoothie was a victim of a driver who wasn't paying attention to her. Other similarities between the Pumpkin (2014) and Smoothie (2007) accidents is that they both imperiled the public safety unnecessarily and both were entirely preventable. A walk along the hack line in New York City reveals ill-fitting tack and improperly and often illegally attached manure catchers. If these are not attached correctly, the weight of one at the end of a shift can cause harness rubs. In some cases, a loose or flapping strap has been blamed for causing an NYC carriage horse to spook. This bravado by the New York Carriage trade is arrogant and hostile to the public at large. That the carriage trade is able to get a foothold on gullible news media and tourists and residents who don't know anything about horses in calling itself professional is frightening. The June 9, 2014, accident involving Pumpkin was a direct consequence of recklessness and incompetence, beginning with a bored carriage horse who was unattended, escalating into a terrifying spooking spree and ending with a bicyclist who took matters into his own hands to jump into the carriage, steer it along the park drive back onto Central Park South and stop the spree by forcing the carriage to wedge itself between a taxicab and a car. The impact smashed the door of the taxi but brought the incident to a close. It was only after the crash that carriage "experts" caucused to get their story straight, finally claiming to have "corralled" the horse without incident. Mind-boggling. We hope that Mayor de Blasio is watching and learning and putting the issue on a fast track toward a ban. Every day that passes without a ban endangers carriage horses as well as the public safety in New York City. There's no room for error. NEXT: What Went Wrong With Pumpkin and His Driver?